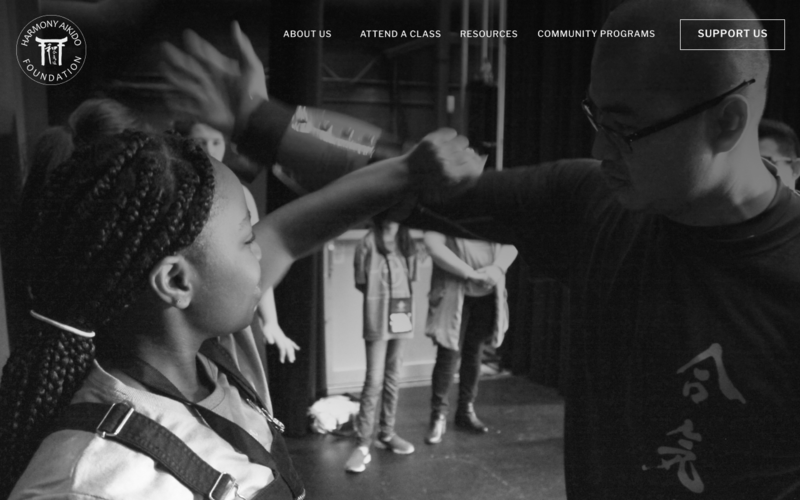 The Harmony Aikido Foundation (HAF) engaged me to craft their digital strategy and design their website. I refined their message architecture and structured their content, which served as the starting point to design a responsive identity site that positions HAF for the future. I worked closely with seasoned developer Daniel James to design and ship this responsive website within a tight design and web development timeline of six weeks. 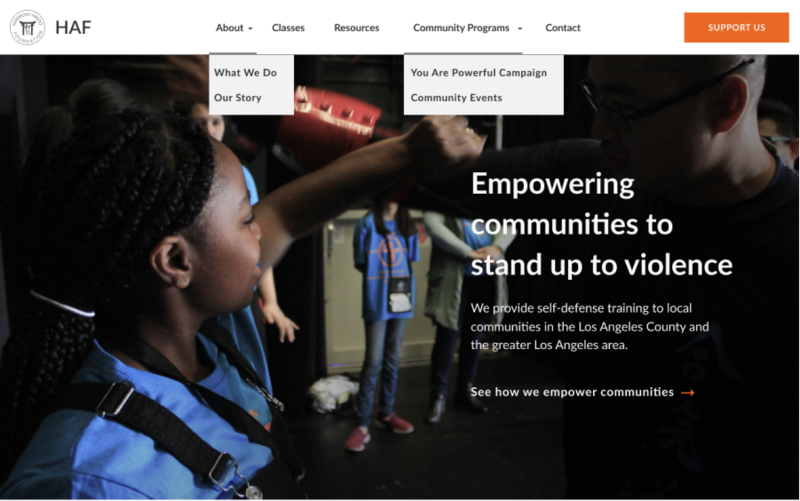 This is a story about how a website design effort became the catalyst for a nonprofit organization to crystalize their future goals and objectives. 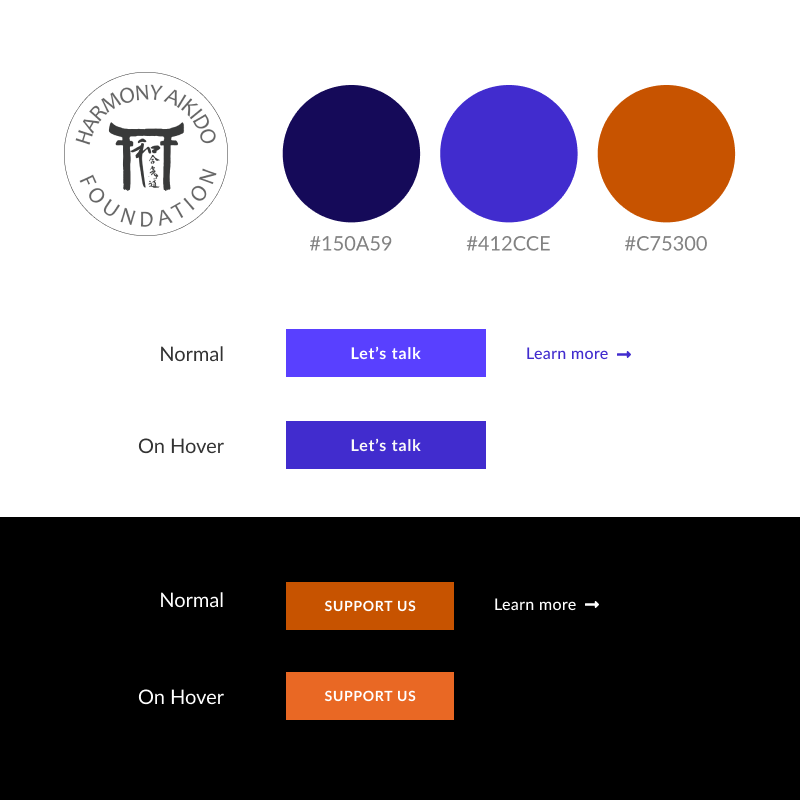 When my friend Chelsea shared that the Harmony Aikido Foundation is in need of a new website to solidify their digital identity, I immediately volunteered. I positioned myself at the intersection of strategy, design, technology, and project management to shepherd the digital strategy and web design processes. My role quickly grew from Web Designer to that of a Digital Strategist. I took the time to conduct one-on-one interviews with each stakeholder. I found this interview format to be more conducive in getting a stakeholder to speak more openly about the hurdles they face in reaching their goals, which naturally led to discussions on how the website can alleviate some of those hurdles. I also learned that I can lean on the depth of each stakeholder's specialized knowledge to complement the wide breadth of my personal knowledge that spans multiple areas. 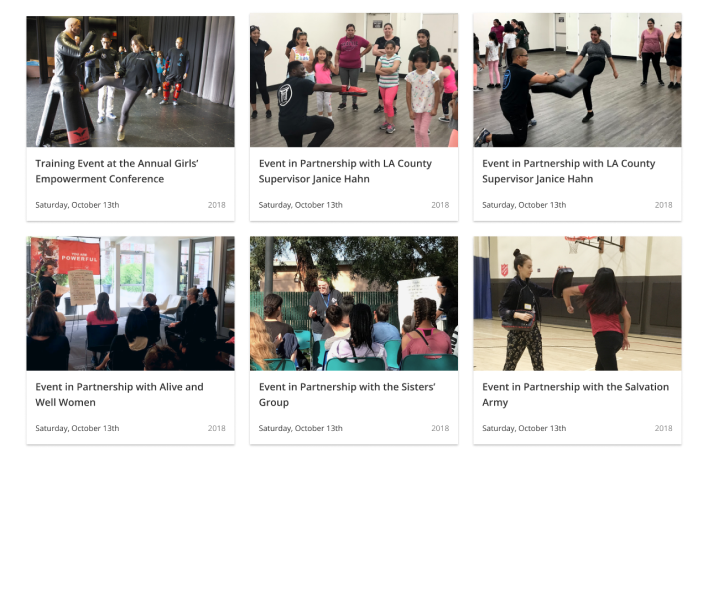 The site will convey Harmony Aikido Foundation (HAF)'s vision, mission, and impact to the general public as well as to the four main groups that HAF interacts with: public officials, program coordinators, parents of participants, and the participants themselves. The site will consolidate all HAF-related information in one digital repository. It will act as a centralized hub that collects traffic from various social media platforms. 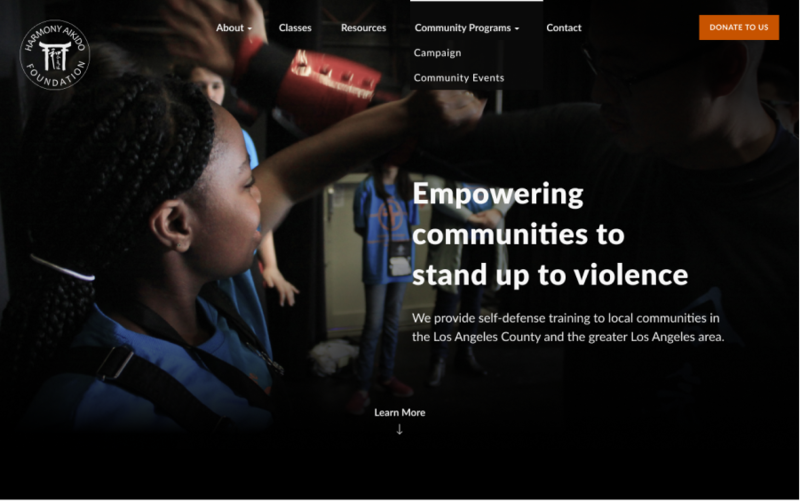 The site will serve to extend HAF’s campaign efforts to the digital space. The Resources section is projected to play a key part in building an online following for HAF, as well as for future media fundraising campaigns. 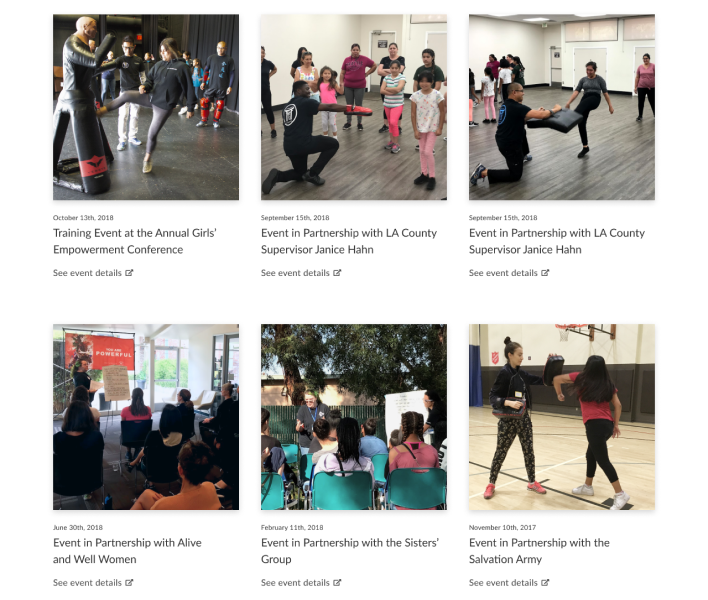 After speaking to the HAF’s Project Manager and Operations Manager, we determined that our primary audience comprise of four groups: the public officials, program coordinators, parents of participants, and the class participants themselves. 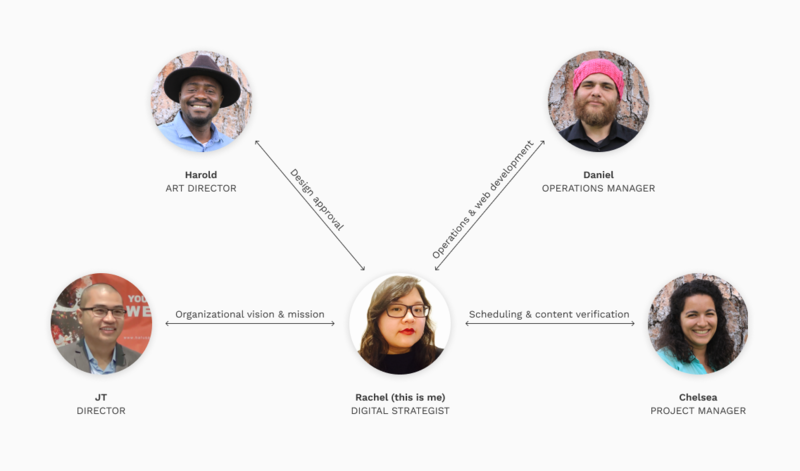 I looked to several key players in the nonprofit space to study how organizations position themselves in the digital space. 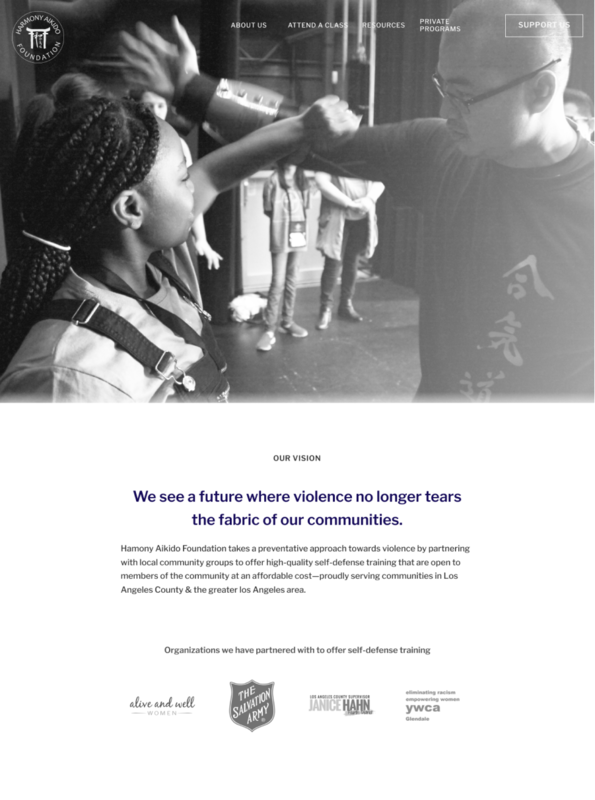 Impact Bay Area of San Francisco and Guardian Gym of Oakland stood out for their focus on empowering individuals to protect communities. I analyzed the way each one communicates their identities through their websites. 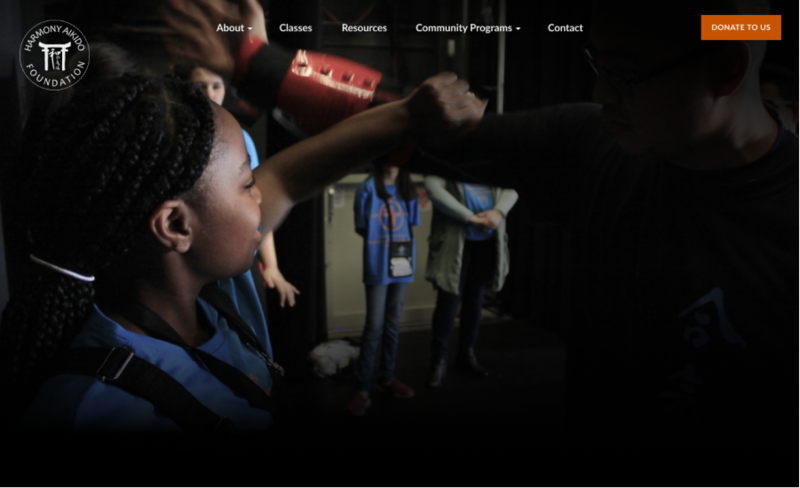 Both Impact Bay Area and Guardian Gym chose imagery that highlight their impact on the community. 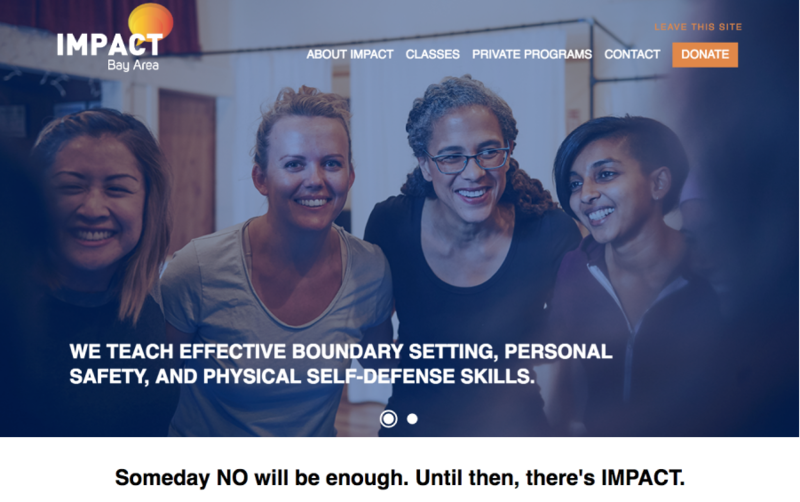 This is a very different approach than the traditional focus on martial arts pedigrees that are prevalent in self-defense sites. However, a key weakness on both websites is in the way they both present dense factual information in blocks of texts that are inconsistently sized and spaced. Both sites would also benefit from more consistency in photography art direction and image-sizing. 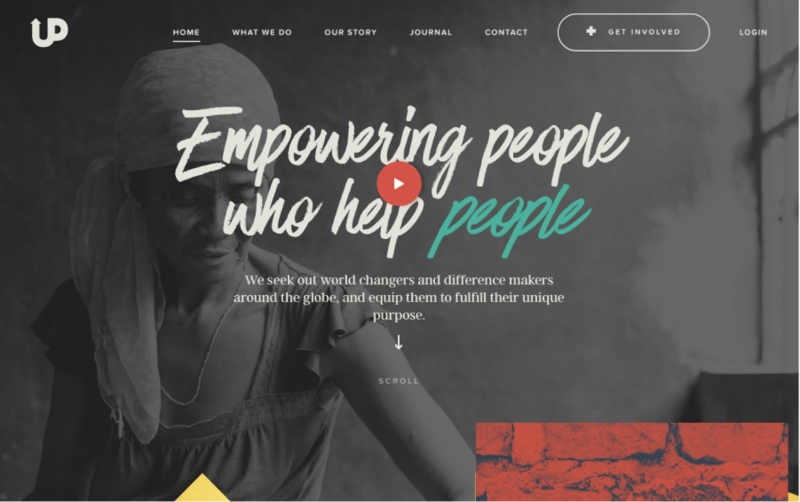 I looked to other nonprofit organizations such as Upstream International and International Justice Mission (IJM) for web design inspiration. 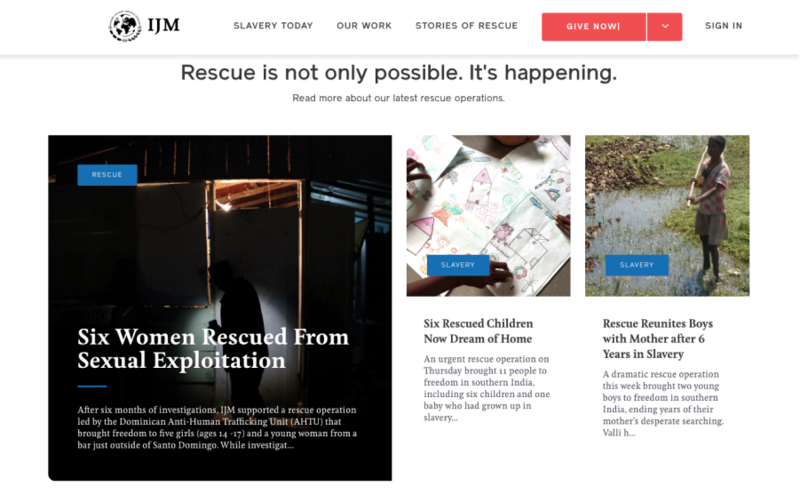 Both Upstream and IJM adopt a long and linear landing page layout with a navigation bar that reappears when the user scrolls upwards. 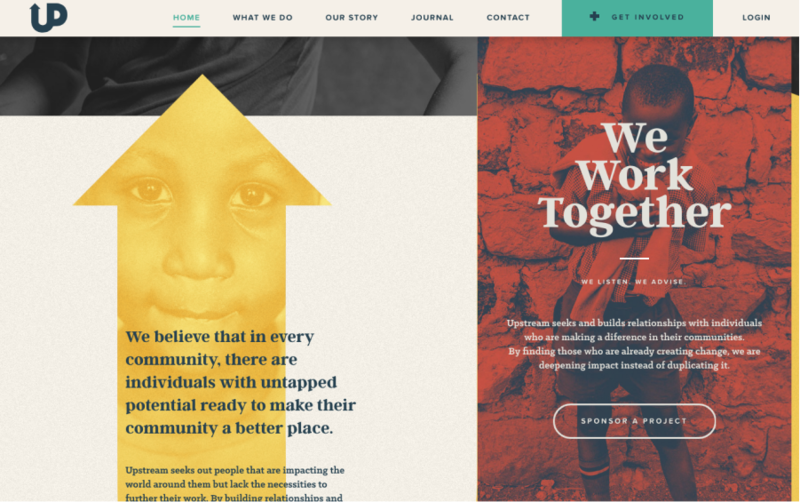 Upstream's use of color and imagery to tell their story is very effective and visually compelling. However, at times it was hampering the legibility of their content. IJM does a great job in organizing dense information into readable chunks supported by imagery. 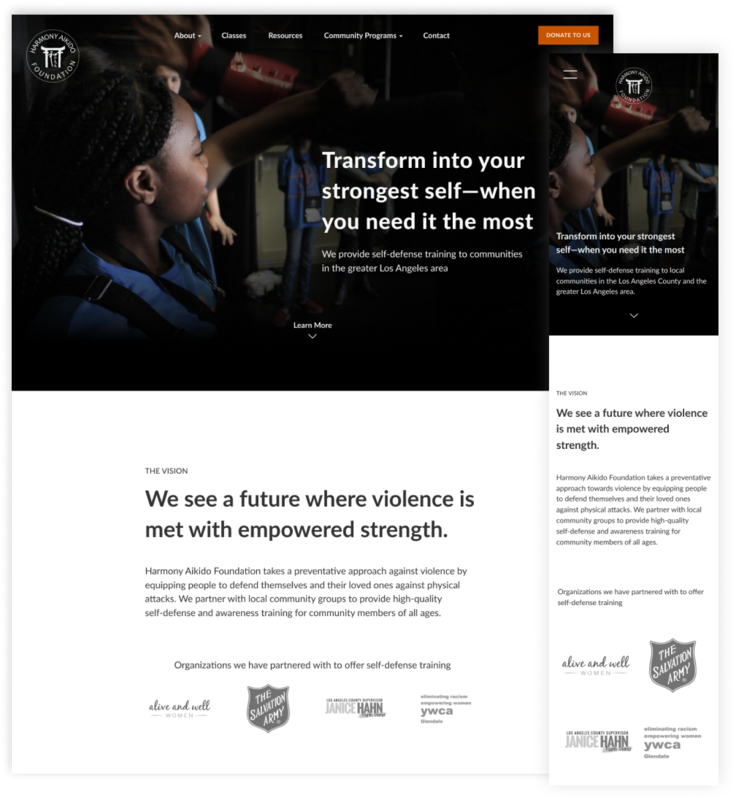 The cleanliness of their navigation bar (at only six top-level menu items) is impressive for a nonprofit of their scale. I began to define the functionality, content, and site navigation through page-level wireframes and site-maps. I was able to narrow down the scope of the website design effort and convey it in this preliminary sitemap. I made every effort to make sure that a piece of information is never more than three levels deep. 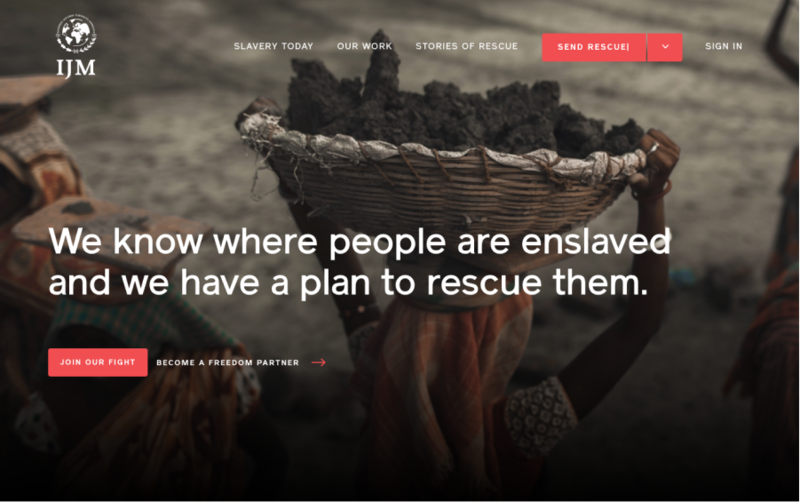 Initially, we considered a carousel of images to grace the hero portion of the page. However we did not want to risk users being unable to discover information because they did not stay long enough for the hero content to auto-advance. At this stage, we knew that we would be implementing a fixed top navigation bar due to the long and linear nature of our landing page. 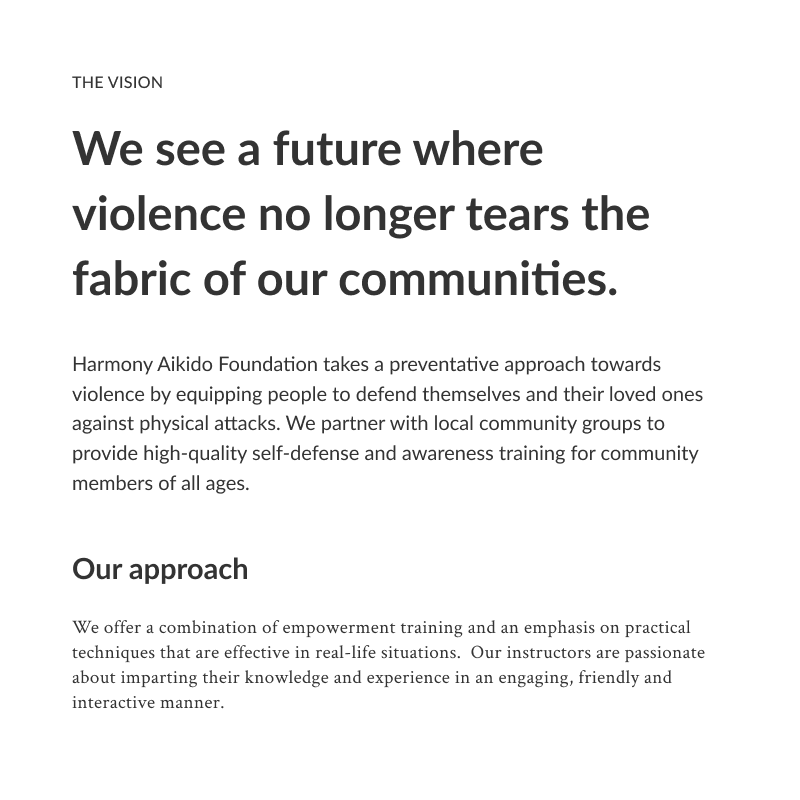 To increase discoverability and facilitate better stortytelling, I opted to go with a long and linear page layout that succinctly narrates Harmony Aikido Foundation’s background, story, and impact using just the right amount of text and plenty of imagery. 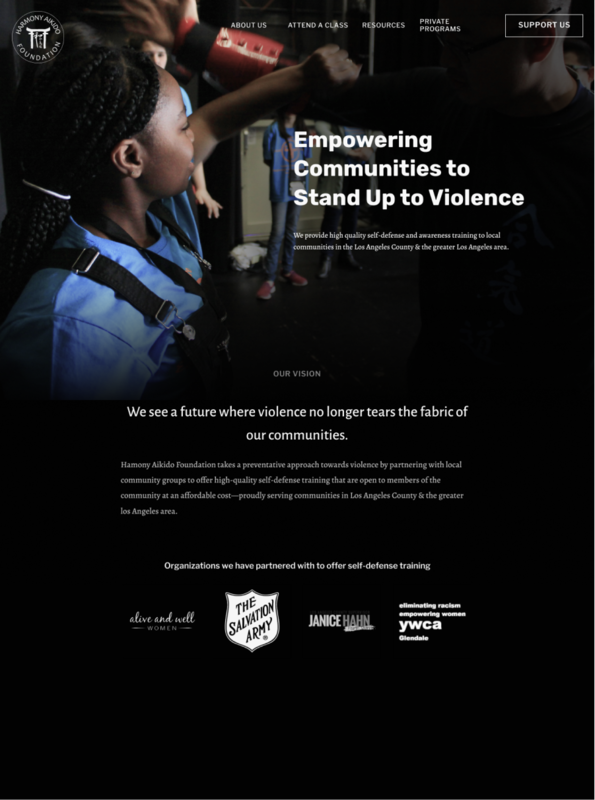 HAF's focus on protecting communities through empowering individuals led to an art direction that focuses on capturing real-life workshop participants through great photography. 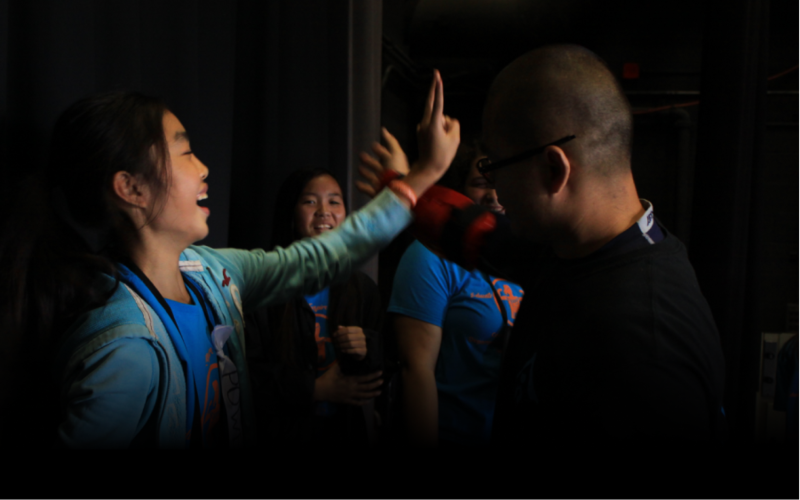 Fortunately, HAF has a talented photographer who happens to be their Project Manager—Chelsea Doryumu. 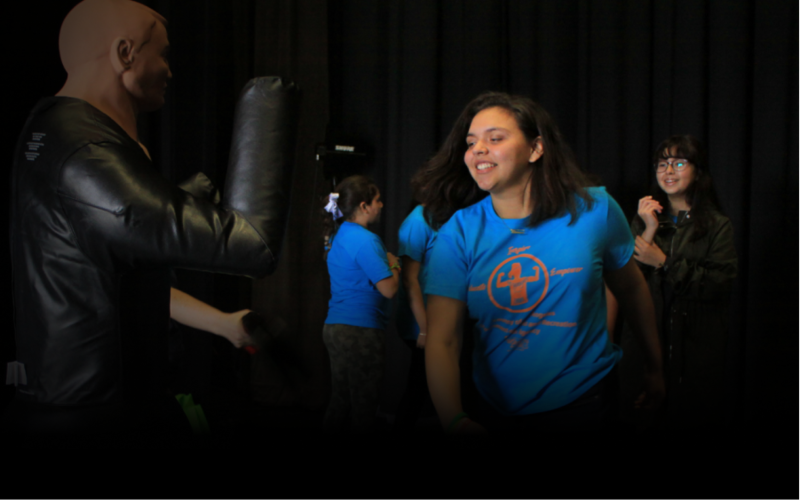 She captured the image of actual participants sparring at HAF community events. Her photographs perfectly captures the essence of HAF as an organization and became the hero feature of each page. With Chelsea's beautiful photography for a primary art direction, I proceeded to create several iterations of the hero feature layout. The long and linear layout of our pages necessitates a fixed navigation bar. Here are a few color scheme studies for the navigation bar. We wanted the focus to be on the featured photography. Since the focal points tend to be towards the center of the image, we aligned the hero text closer towards the bottom of the hero image. At desktop widths, we provided a horizontal top navigation bar that docks to the top of the viewport once a person scrolls past the hero image. It was important to give users the ability to quickly navigate to and from a page at any point during their page-scrolling experience. At tablet widths, the top navigation bar collapses into a double-bar icon that summons a navigation drawer when tapped. At mobile widths, the same double-bar icon summons a modal view that covers an entire viewport. Crimson Text with its generous x-height is chosen for the body text. For its ability to complement the geometry of Crimson Text, the typeface Lato is chosen for headers. It also has enough warmth and personality to work as a display face. A complementary color scheme of blue and orange suits the project requirement of a bright hue for dark backgrounds, and a dark and more saturated hue to stand out against the white background. A tight deadline of 6 weeks and a very lean team led me to create a center-aligned page layout that takes advantage of interchangeable page components. In the end, this tight constraint led to a design that is very consistent in structure, but offers flexibility in arranging content. 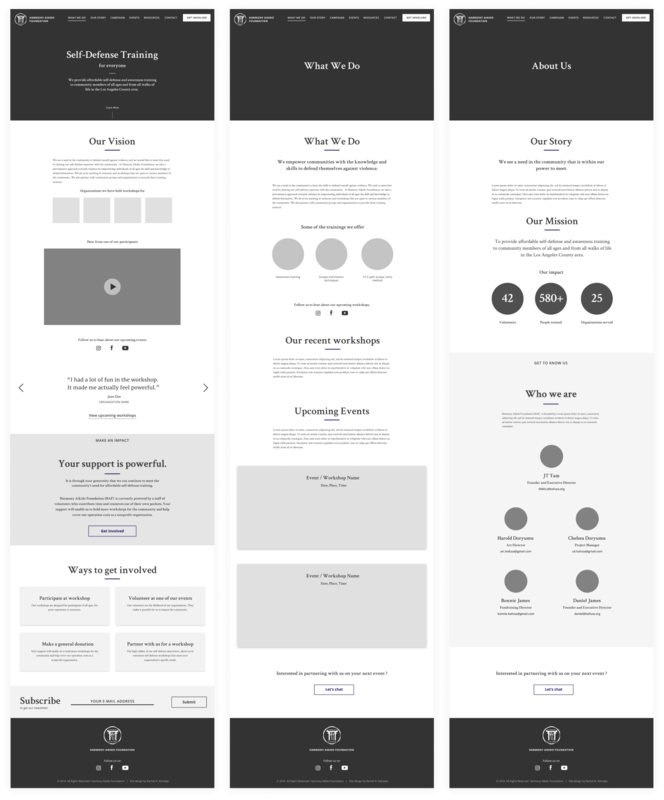 Below are the high-fidelity mock-ups of the final website design. All photography featured in the hero elements of each page are courtesy of Chelsea Doryumu.